약사유리광여래본원공덕경은 줄여서 ‘약사경’이라고 부르기도 하는데, 질병의 치유를 기원하기 위한 경전이다. 이 약사경은 속장경을 간행하기 위해 1086년 흥왕사에 설치한 교장도감(敎藏都監)에서 펴낸 것 가운데 하나이다. 닥종이에 찍어낸 1권으로 크기는 세로 30㎝, 가로 16㎝이며, 제목 아래 대장경의 천자함(千字函:천자문의 순서에 따라 책의 번호를 매기는 방법) 표시인 ‘국(鞠)’자가 적혀 있다. 대각국사 의천이 속장경을 간행하던 중 숙종 6년(1101)에 돌연 병이 생겨 그해 10월에 입적하게 되는데, 그의 병이 치유되길 기원하기 위해 대장경판에 근거하여 간행에 착수하였고 숙종 7년(1102)에 완성하였다. 이 책은 새김의 솜씨·글자획·종이질 등이 고려시대의 목판을 보고 다시 새긴 것을 조선시대에 찍어낸 여러 판본들과 비슷한 것으로 보아 조선초에 만들어진 것으로 추정된다. Bhaisajyaguru Sutra is a Buddhist scripture that prays for recovery from illness. This book was one of the publications printed by Gyojang Dogam (Directorate for Buddhist Scriptures), which was established at Heungwangsa Temple in 1086. Printed on mulberry paper, it measures 30 cm long and 16 cm wide. The Chinese character “鞠 (guk)” written below the title indicates that the book is given a number based on the Chinese characters’ order. The woodblocks of Bhaisajyaguru Sutra began to be carved based on the printing woodblocks of the Tripitaka Koreana when State Preceptor Daegak suddenly fell ill during the publication of Sokjanggyeong (Supplement to the Tripitaka Koreana) in 1101 (sixth year of the reign of King Sukjong of the Goryeo Dynasty). He finally passed away in the tenth lunar month of the same year, and the woodblocks were completed the following year. 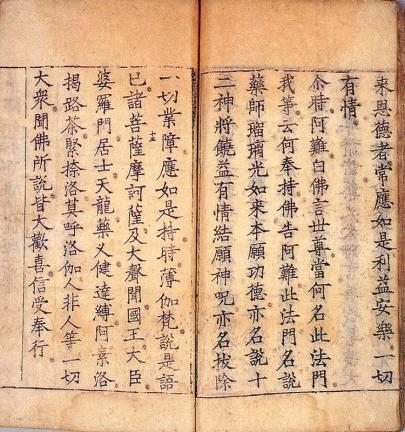 This book is presumed to have been printed using the woodblocks made in the early Joseon Period, judging from the carving technique, paper quality, and character strokes.